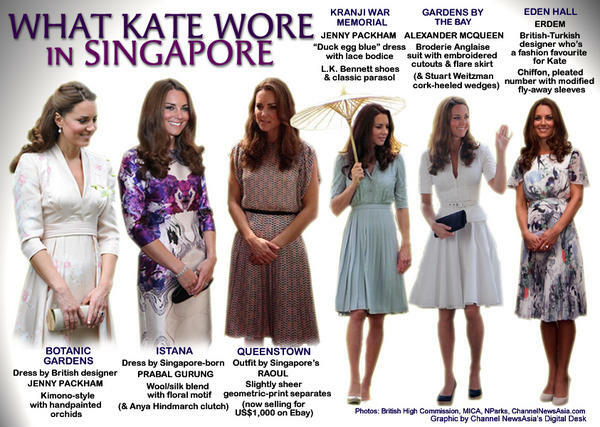 Royal Tour 2012: Singapore Fashion Recap - What Would Kate Do? Our personal favorite is absolutely the Alexander McQueen Broderie Anglaise outfit. It’s a gorgeous, flattering outfit which was perfectly suited for the heat and humidity which appeared to be omnipresent. Second favorite is the Prabal Gurung dress which combines the regal color of purple with some florals to represent the country… And the fact that the designer is Singaporean is icing on the proverbial cake. Oddly enough our least favorite is the Raoul dress which while still a pretty option is just a little too pedestrian in our opinion. Then again, maybe we’re not fashion experts as it’s now selling for $1,000 US on eBay? !